Airlie Beach Magnums i Airlie Beach, Australien : Boka nu! Nothing special, everything was quiet good. Stayed 1 night in a dorm, it was good. Very big and good beds. My cruise gof canceled so I had to stay 2 more nights but in a cabin. It is smaller, but you have your own fridge for 8 people in the room. The bunkbeds in the cabin are a bit dangerous because you can fall down from the top bed (happened to a room mate). I guess I would stay here again. Big hostel, really nice small houses that you are livin in, nice straff. especially Maria in the reception, she were so nice and friendly to me! Kitchens are too small and quite messy. Wifi is pretty poor and only in one outdoor area. The dorms are cabins and it’s a really nice and cozy walk to get to them. Nice with bathroom in dorm room but not at all sound proof. Very few outlets in rooms but a fridge in each room. Overall I liked this place but it’s a bit overpriced. The twin private rooms was nice and clean, don't know about big doorms though. The wifi was OK but located in the jungle. Could check in at 8 am which was nice, but dorm wasn't cleaned during the 26 hours we stayed there (not even the overfilled garbage bin was changed), and saw cockroaches in the bathroom. 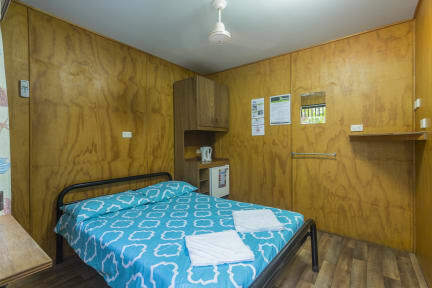 Otherwise the 8 bed dorm was spacious and air con worked very well. Nice private room except that it smelt really bad. The kitchen was really disgusting . Everything was dirty and there was not enough equipment including basic things such as plates,glasses etc. The guy who was responsible for the kitchen were hanging around and chatting with everyone but didn't clean or do anything that made any sense. A bit uncomfortable as he was chatting/flirting with the girls all the time.. Dirty kitchen. Did'nt enjoy the forest which the hostel were located in, much animals. Rude staff. They didn't seem to care about their guests and seemed very bored. Some of them where nice tho. No WiFi in the rooms and common area WiFi didn't work. Messy and small kitchen with no working stoves.